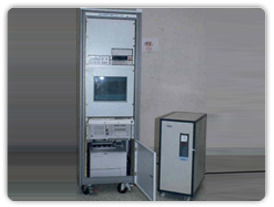 Actuator Test System consists of actuator test electronics, test rig and data acquisition / analysis system. This system acquires various data from the feed back system and the control signals of the actuator and these are used for further analysis of the system. System Controls have provided effective solution for data acquisition and analysis during actuator dynamic. This is ground test equipment providing different control signals to the actuator. Safety features are provided to monitor the threshold levels of various parameters and render protection against malfunctioning.